UXO Disposal "Down the Shore"
Monmouth County, New Jersey A U.S. Navy EOD team will carryout a controlled explosion to dispose of a UXO that washed ashore at the Sandy Hook Unit of Gateway National Recreation Area in northern Monmouth County. The item was identified as a mortar round. The park will be closed to the public while the Naval Weapons Station Earle's EOD team conducts the operation at Sandy Hook, a site which frequently has reports of ordnance items on its beaches. The area is near Fort Hancock, an active military base until 1974 as well as the proving ground of the U.S. Army from 1874 until 1919. Hilton Head, South Carolina An EOD team from Marine Corps Air Station Beaufort removed a WWII-era training round from the beach at Palmetto Dunes on Hilton Head Island. The item was removed and taken to the air station where it will either be rendered inert and preserved if has historical value, or safely destroyed if not. Tallahassee, Florida It may be normal to hear loud noises from college campuses, but the big boom heard by people in the area of Florida State recently wasn't rowdy football fans or partying Greeks, it was the controlled detonation of a WWII bomb unearthed by construction workers building a college apartment complex near the campus. The blast, carried out by the Tallahassee Police Department with the help of a Tyndall Air Force Base EOD team, was safely executed after the EOD team excavated a deep hole and buried the bomb before detonating it. The bomb fell out of the roots of a tree that workers pulled from the ground. A remediation team has been hired to insure the area is clear of other UXO. 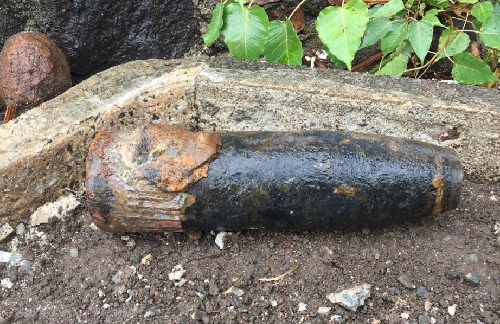 Liliha, Hawaii Crews assisting with yard work at a residential property were surprised to unearth a projectile laying in the area. The workers called the police who responded with support from an Army EOD Unit based out of Schofield Barracks. EOD transported the munition (show below), identified as a 5"/38 projectile, to Schofield Barracks for proper disposal. Mantua Township, New Jersey An EOD team from Joint Base McGuire-Dix-Lakehurst performed a controlled detonation of a UXO item found on the grounds of Gloucester County Christian School. The munition was determined to be a 40mm round from an M-203 grenade launcher. Contractors clearing ground in a wooded area for a nature trail found the ordnance in the late afternoon when the school day had ended. Children remaining on school grounds for after school activities were immediately evacuated as crews responded to the scene. According to officials no one was in immediate danger, but the item was located only a few hundred yards from the main school building. 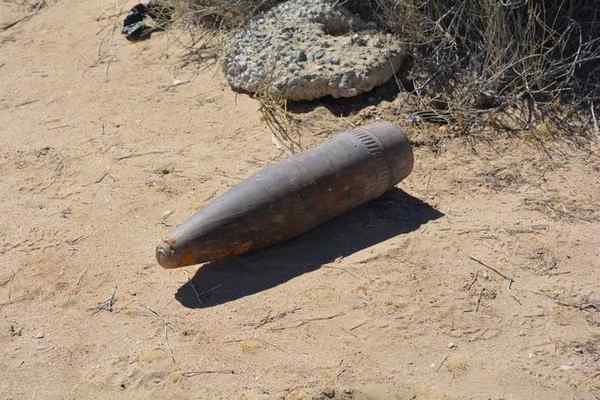 Victorville, California Workers on a homeless outreach project searching a desert field for homeless people made a startling discovery when they found a 155 mm projectile. The workers called the police who responded with a local bomb squad to remove the ordnance. The projectile was determined to be live. Sheriff's office suspect that the munition was dumped illegally near a residential area. Ypao Beach, Guam A volunteer picking up debris at the Gov. 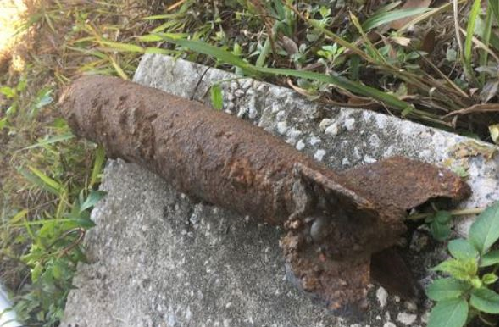 Joseph Flores Beach Park in Guam found something even more dangerous than the usual old nails and broken glass. He found an item which appeared to be a grenade. Not knowing what it was, he picked up the device and placed it at a nearby lifeguard tower. The man continued with his beach cleanup before notifying authorities of the object which was later deemed a UXO. A portion of the Ypao Beach shoreline was evacuated for about an hour while emergency personnel and Navy EOD Mobile Unit 5 Detachment Marianas responded to secure the munition. 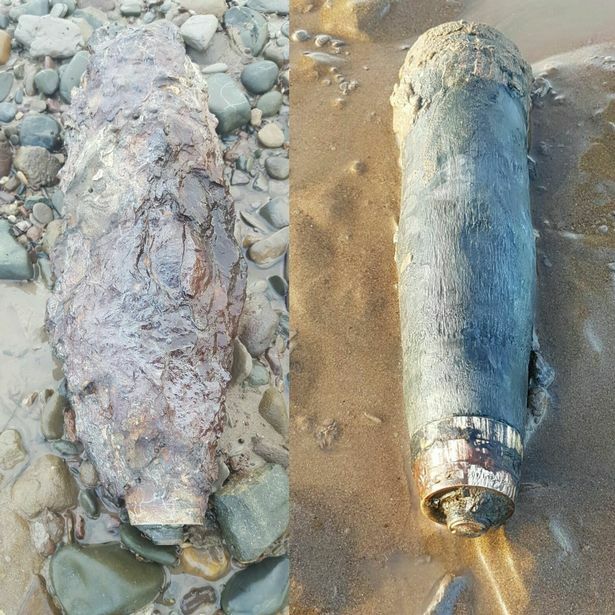 Monmouthshire, Wales The Chepstow Coastguard was called to investigate reports of a possible UXO along the banks of river Severn on the Welsh coast. The UXO was found less than 1,000 feet from the Black Rock picnic area. After the Coastguard verified that the item reported was indeed ordnance related, a Royal Navy bomb disposal unit was called in. The WWII era munition (shown below) was safely disposed of by EOD. Richmond, Virginia A construction crew uncovered a small cache of ordnance while rehabbing a historic building in Richmond. Workers contacted police after finding hand grenades and large-caliber ammunition. The ordnance was estimated to be at least 30 years old. Because officials identified the items as military ordnance, an EOD team from Fort Belvoir was dispatched to respond. Area streets were shutdown during rush hour to allow for safe removal of the munitions. Gagetown, Canada A team from the 5th Canadian Division Support Base (5 CDSB) Gagetown was dispatched to Prince Edward Island on Monday to take care of an old military ordnance that had been stored in a shed in Goose River for years. The Royal Canadian Mounted Police (RCMP) received notice of the device and secured the area until the EOD team arrived.